Hey everyone! I'm sure by now you've all heard the super-viral Kpop song by Psy called "Gangnam Style". He's been everywhere from Ellen to SNL to local radio stations and it's no wonder considering the song is insanely catchy, comical, and has a corny dance to boot. And here are my pics of the look! You can really see the puppy-dog effect of the eyes here. The eyeliner is drawn horizontally out from the bottom lash line, causing a half moon shape. The shadow on the lid is a neutral shimmery color which doesn't distract too much from the heavy liner and pink gradient lips. On the cheeks, those with tanner skin can use a warm bronzer between temples and ears like I did. Fairer skintones like Hyuna can use orange or peachy blushes as well. And of course, what is any good Kpop look without getting into the cheesy dance spirit as well? I have literally been doing this dance all around my new apartment, much to the chagrin of my husband. Hahaha! After completing this makeup, my husband called me "Hyuna" and I kept doing double-takes when passing the mirror. I usually don't feel that way, but this time I weirdly did see some resemblance since the eyeliner changed my natural eye shape so much. What an odd feeling! Let me know in the comments if this has happened to you too! Thanks so much for reading and I hope you enjoyed the tutorial! Thanks for the tutorial! I never noticed how light Hyuna's eyebrows are... strange! very nice! ^^ you're so pretty.. I think Hyuna is gorg, and so are you! Tks for the tutorial. I think it's dramatic but also natural! Can you do a make-up/hair tutorial of Orange Caramel's Nana, from the Lipstick m/v? Love the gradient lips on for this look! go and get your horse dance on! hahaha love it. great video! I actually like how it looks with the darker brows b/c in the video it looked a little scary with her bleached brows and dark makeup. btw what eyeliner brush do you use with the mac fluidline? Great job on the makeup tutorial, love this look! haii jenn finally you give us tutorial vid! Hahaha! Well, nothing wrong with trying it once! :) I've actually heard the "Mona Lisa" brow trend is popular in Korea but I could never personally do that. Brows are such an important feature! Your version is beautiful. I just cannot wrap my mind around why anyone would actually desire to look like the girl in the video. Looks incredibly doctored. I loved the look it is gorgeous. I like it because its plain yet stands out. And I am glad that at least you have eyebrows unlike Hyuna. When I first saw the MV I thought Hyuna had no eyebrows. I guess she is trying the "Mona Lisa" eyebrow trend. But it does not match her at all. But I prefer the look with eyebrows. I think you pulled off the look the best out of all the Yotube gurus I have watched so far. I tried the droopy puppy eyeliner but it did not look good on me at all. It makes me a lot younger. I hope that you will do the look from Hyuna's new MV Ice Cream. She has much more dramatic eyeliner in her new MV. And a lot of big lashes. I think it would be a perfect partly look. I loved the look its simple yet it makes you stand out. And I am glad that at least you have eyebrows unlike Hyuna. I think Hyuna is trying the “Mona Lisa” trend that is currently going on in Korea. But I have to say that it does not suit her at all. 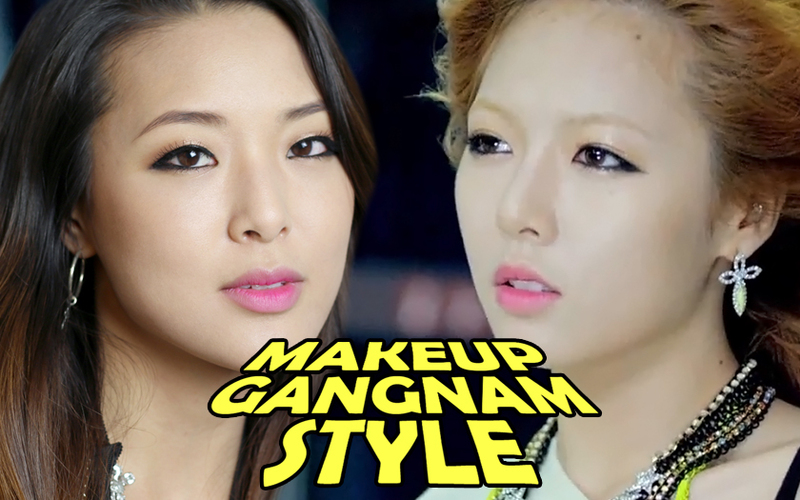 I think your tutorial matches Hyuna’s makeup look the best out of all the videos I watched from other gurus. I tried doing the “droopy puppy eyed” look but it does not compliment my eyes at all. It also makes me a look a lot younger than normal. I wonder what eyeliner brand Hyuna uses because her eyeliner is very dark. I know that many Korean makeup artists love Bobbi Brown eyeliner. I hope that you will do Hyuna’s new look from her new MV “Ice Cream”. She had much more dramatic eyeliner and huge falsies.